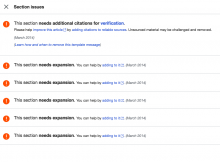 Originally in this tasks we had not considered subsections. Subsection issues required writing code to identify which section contents belongs to - much trickier than a 3 pointer. Some nitpicks on patches remain. 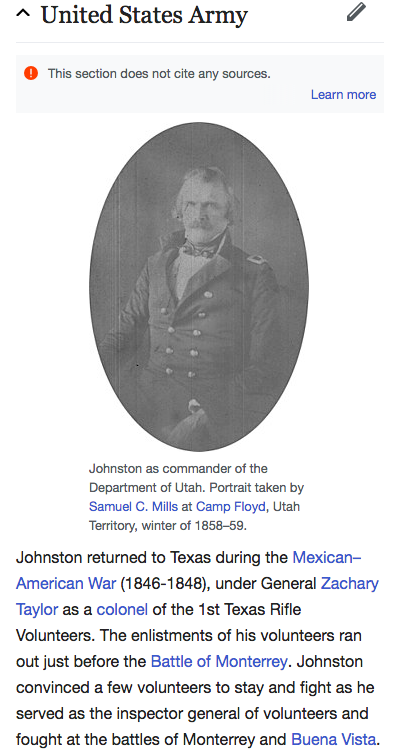 Visit page https://reading-web-staging.wmflabs.org/wiki/Albert_Sidney_Johnston and open the "United States" section. There should be an issue banner with an orange circle icon. Click on that and make sure there's only one issue listed in the modal. 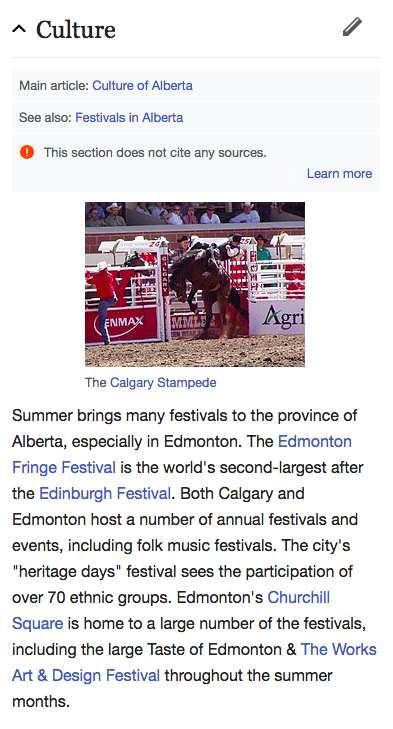 Visit page https://reading-web-staging.wmflabs.org/wiki/Alberta and open the "Culture" section. There should be an issue banner with an orange circle icon. Click on that and make sure there's only one issue listed in the modal. Visit page https://reading-web-staging.wmflabs.org/wiki/Equity_release. This page has both a page issue and a section issue (in the "United States" section). 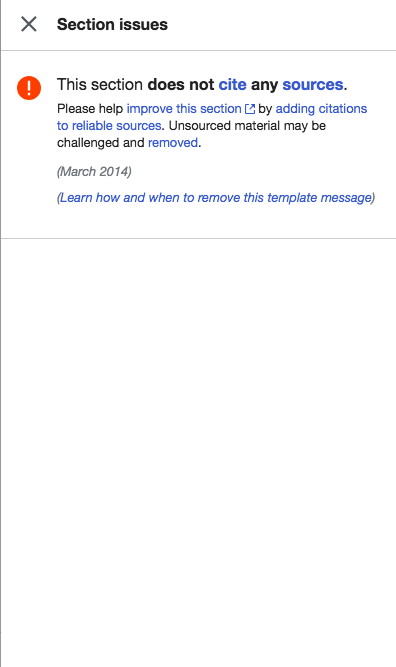 Clicking the page issue at the top of the page should lead to a modal with only a description of that issue. Likewise for the section issue. Neither of the modals should contain descriptions of both issues. Visit https://reading-web-staging.wmflabs.org/wiki/Pharmacovigilance. This page has multiple page issues (3) as well as section issues (the first five sections each have an issue). Again click the issues and check the modal to make sure that only the issue descriptions pertaining to the respective issues are appearing. So each of the section issues should only display one issue in their modals. On Albert Sidney Johnston and Alberta "Page issues" gray text below page title should NOT show (current issues only displays for lead section). This should match what is currently in production. 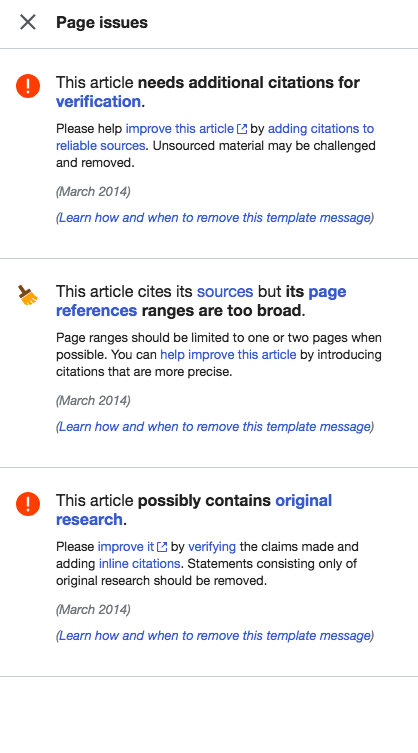 On Equity_release ensure "This page has issues" banner shows at top and only contains one issue relating to citations. This should match what is currently in production. On Pharmacovigilance ensure "This page has issues" banner shows at top and only contains three issues. This should match what is currently in production. Check "Category:Use_American_English_from_January_2014" and "Talk:Pharmacovigilance" show a link under the title. This should match what is currently in production. Right now we only extract issues from the first section. We will need to run this code on every section when the user is in the new treatment. Right now the issues overlay is tied to the route #/issues. We will need to expand the route to #/issues/《sectionNum》to link overlays to their corresponding section. Should be relatively straightforward but may require storing an object which links section id to list of issues (right now we store section 0s issues in a local one dimensional array). Note on desktop there is currently no concept of sections. Here it's probably best to show all issues inside a single overlay linked to from all issues in page. Dont worry too much about desktop Minerva. Long term the parser will have sections and this problem will go away. 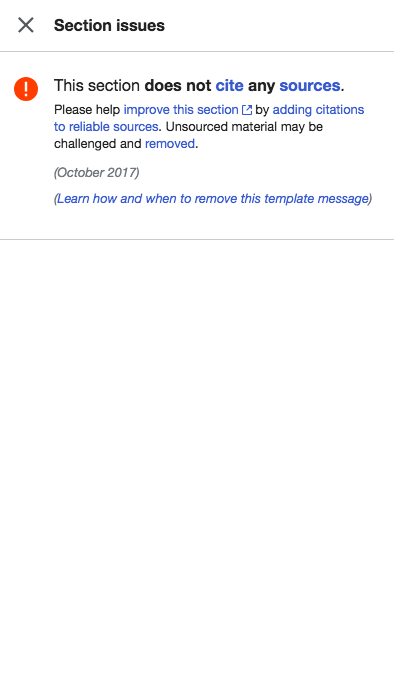 Would it be possible to have the title of the modal be "Section issues" for section issues? My apologies for not thinking of that earlier. This is technically a "Section issue", no? How to handle these? Would "Page issues" be confusing here? @Jdlrobson good call out. The way I'm thinking about it is more like "this issue has been placed at the Page/Section level". So it's less about the contents of the issue/template, and more just communicating where in the page it is. Does that make sense? I'm hoping this would alleviate any confusion of someone opening a section issue and not seeing the page issues listed. Jdlrobson removed alexhollender as the assignee of this task. Jdlrobson assigned this task to alexhollender. On staging for design review! 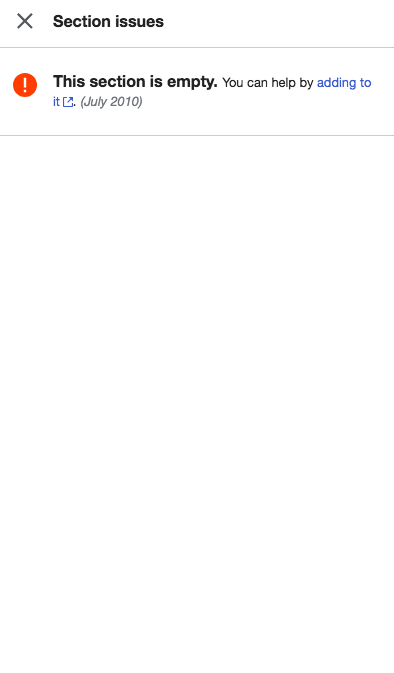 Jdlrobson added a subscriber: Niedzielski. @Alex @Stephen i looked into the section issue. Looks like it's going to be very tricky to show subsection issues separately. 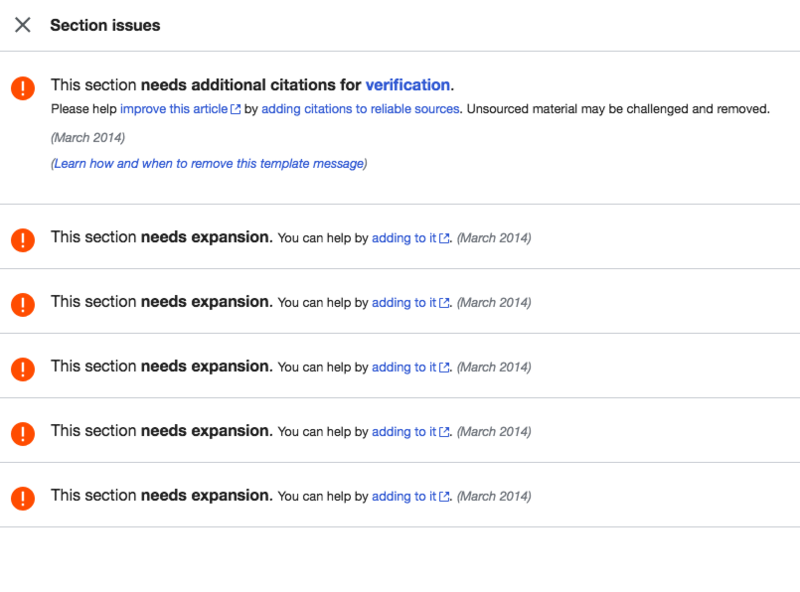 https://gerrit.wikimedia.org/r/445667 adds some consistency between editor sections and issues sections but doesn't resolve the subsection issues. I'm not sure whether that's worth pursuing. I'm off on vacation now. Feel free to grab this while I'm gone. Looks like it's going to be very tricky to show subsection issues separately. 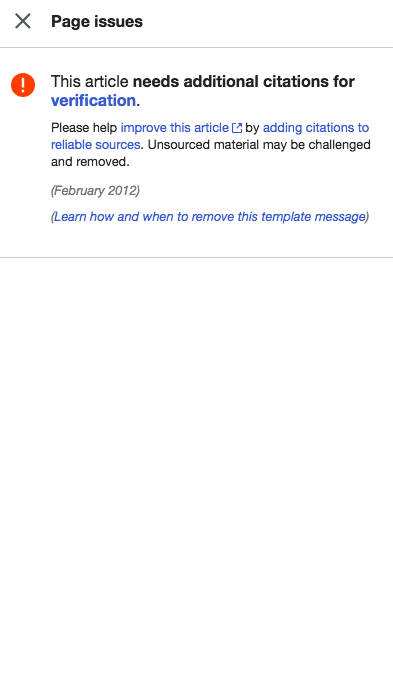 I think it's fine to show subsection issues with section issues in a single modal. @alexhollender, @Jdlrobson - This feels a bit odd to me. If we have an article like the one above - the issues here seem a bit repetitive, especially if there's no additional information on the particular issue. @Jdrewniak, @Niedzielski, feel free to fix this issue since you're already deep into page issues and @Jdlrobson is on holiday. 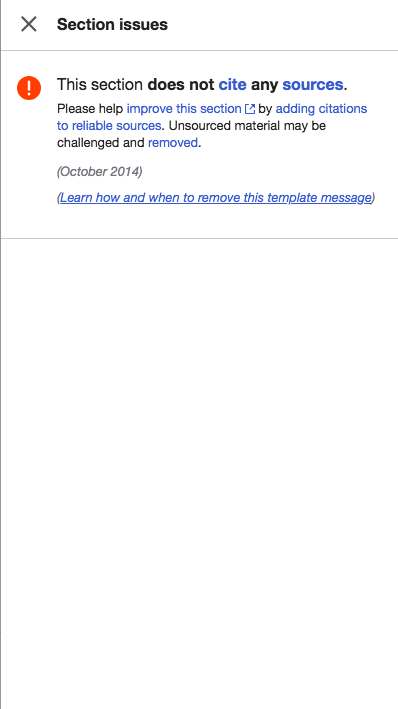 @ovasileva agreed that the modal with section + subsection issues looks odd. I'm not sure how to handle these. I think it makes sense to distinguish between issues on the entire page from issues within sections, but if we start distinguishing sections from sub-sections it may get a bit tricky because I assume since we go all the way down to H4 there could be sub-sub-sub-section issues. Not sure where to draw the line? I think option 2 makes the most sense. @Jdlrobson - do we distinguish between section and subsection issues? Another option would be to hide subsection issues altogether. Should I update this task and re-estimate or should we create a new task? The scope has changed considerably and it might be worth talking about this in next grooming! @alexhollender, @Jdlrobson - discussed this during kickoff. We think the best way forward would be to remove subsection issues. @alexhollender - we discussed this in person last week, adding a note here to confirm that - let me know if anything's changed since then. We think the best way forward would be to remove subsection issues. @Jdlrobson does this relate to your change for identifying issues by section level via 'h1,h2,h3,h4,h5,h6'? Maybe we can still leave the subsection issues inline but identify top level issues in the dialog by passing it h1 issues only? @Jdlrobson - what is the treatment for subsection issues that you tried? Do they appear at each subsection? got it - that's perfect! @alexhollender - any thoughts from your side? Jdlrobson moved this task from Needs Design Review to Needs Code Review on the Readers-Web-Kanbanana-Board-Old board. https://gerrit.wikimedia.org/r/#/c/mediawiki/skins/MinervaNeue/+/448012/ still needs code review. Jdlrobson removed a project: Patch-For-Review. alexhollender added a project: Audiences-QA. phuedx added a subscriber: Ryasmeen. @ovasileva: Since you're the PO and you've just QA'd this, who do you think should sign it off? hmm, maybe @alexhollender, or really anyone that hasn't worked on the task?